Support Animania! Become a Patreon! Animania is an immersive mod that replaces and improves the passive animals in Minecraft, adding multiple breeds, genders, new behaviors, and several new species. If attacked, some animals will run in fear for an extended period of time and may act more unpredictably near you. Others may attack back (like the Bull). If animals do not eat or drink, they become unhappy. They will become weaker, make less noise, and emit smoke particles. Animals will only breed or drop their top resources when they are happy, so you are encouraged to take good care of your animals and their environment. Please note: on 1.11 and 1`.12 versions, the WAILA or TOP mod can display additional information about what's happening in the world, simply by pressing Sneak while viewing animals or blocks. This includes animal information like if they are Hungry, Thirsty, Pregnant, Pregnancy Timer, Ready to Shear, Ready for Milking, Looking for Nest, Wool Regrowth Timer. Block information can include info like Nest Type, RF Generated (Hamster Wheel), and Trough contents and amount remaining. The new animals are found all over the overworld, located in different biomes and biome types more accurate to their species and breeds (Animania is fully compatible with Biome Dictionary and mods like Biomes O' Plenty). To make friends with animals, simply give them their favorite food. See animal types below to learn more. There are achievements/advancements for each breed. Collect them all and win big prizes. Note: Prizes equal the amount of sheer satisfaction you get from accomplishing things in video games. New species and breeds will constantly be added to the game. All animals can use a lead (you will need it). A simple recipe for Lead has been included in the mod. On the 1.11 and 1.12 versions of Animania, there is a strong integration with WAILA, TOP, and JEI, which will give you additional information about your animals and items. We highly recommend using these as companions. Animania Cows, Chickens, and Horses, extend the vanilla counterparts and are compatible with Cooking for Blockheads, Hatchery, Astikoor and others. Most resources in the game are in OreDictionary and should be compatible with mods like HarvestCraft. Vanilla items and resources still drop from Animania mobs in case you need them for other mods. You can also customize the individual drops from any animal in the config. Though Animania replaces vanilla animals, this can be also turned off in the config if you want to keep them in game. Animania animals play well will vanilla animals. Please feel free to use this mod in any modpack, public or private. There is no need to notify or ask us, please just mention Purplicious_Cow and RazzleberryFox in the pack if you do make it public, and link back to this forum post. There are five breeds of cows in Animania. Each has slightly different drops, resources, and attributes. For instance, a Holstein is known for the quality of its Milk, while an Angus is more of a Beef cow. There are six breeds of Pigs in Animania. Each has slightly different drops, resources, and attributes. All pigs drop meats, some are better with Bacon, some with Roasts. They love to roll in the mud and swim! Be sure to make them a mud pit and a little pond to dive into! All Animania adult pigs can be ridden. Just make sure they have been fed and watered, and right click with a Carrot and Stick. The 'speed boost' feature can be enabled by using your stick again while riding. Favorite food: Slop, Carrots, Beets, Potatoes. Pigs can also graze tall grass. There are 5 Chicken Breeds in Animania. Each has slightly different drops and resources. For instance, the Orpington drops the best meat, while the Wyandotte lays brown eggs, and Leghorns lay eggs the fastest. Chickens can drink water from troughs, freshwater lakes and rivers, or from water buckets. Unlike pigs and cows, they do not consume a full water block or bucket. Chickens eat seeds. This can either be hand fed to them, or scattered on the ground by right clicking with seeds in your hand. Chickens lay eggs in nests. You can either gather these eggs or leave them for the Rooster to help turn into baby chicks. Favorite Food: Seeds (in 1.11 and 1.12, all vanilla seed types will work. There are currently 6 different colors of Draft Horses. Draft Horses are intended to be work horses, and do not replace vanilla horses. Draft Horses do not have any special drops. All Animania adult Draft Horses can be ridden. Just make sure they have been fed and watered, and right click with a Riding Crop. The 'speed boost' feature can be enabled by using your Riding Crop again while riding. Use a Riding Crop on a Fed and Watered Draft Horse to ride it. No saddle is required. Adult sheep can be sheared for Wool. Some Animania sheep drop unique Wools. With WAILA or TOP installed, you will be able to discover if the Sheep is ready to shear, when the wool will grow back, if the Sheep is pregnant or ready to milk. The Angora goat can be sheared for Wool (like Sheep). With WAILA or TOP installed, you will be able to discover if the Goat is ready to shear, when the wool will grow back, if the Doe is pregnant or ready to milk. Fainting Goats will indeed faint if you sprint directly into them. Don't worry, it does't hurt them. All goats drop meat (Chevon). Some goats drop Prime Chevon. There are currently 2 ferret colors, Grey and White. Ferrets can be tamed, and will follow you once you feed them their favorite food. You will know they are tamed because a heart will occasionally float above their heads. Ferrets can 'sit' and stay by right-clicking them. Click again to make them stand. Tamed Ferrets can ride on your shoulder. Simply sneak + right click to add them to your shoulder. Repeat to put them back down. There are currently 2 Hedgehogs, normal and albino. Hedgehogs can be tamed, and will follow you once you feed them their favorite food. You will know they are tamed because a heart will occasionally float above their heads. Hedgehogs can 'sit' and stay by right-clicking them. Click again to make them stand. Tamed Hedgehogs can ride on your shoulder. Simply sneak + right click to add them to your shoulder. Repeat to put them back down. Hamsters come in many different colors. They love storing the food you give them in their little cheeks and following you around if you have food in your hand! Hamsters can also be tamed by feeding them their favorite food (Hamster Food). Hamsters can sit and wag their tails when tamed. Tamed Hamsters can 'sit' and stay by right-clicking them. Click again to make them stand. Tamed Hamsters can ride on your shoulder. Simply sneak + right click to add them to your shoulder. Repeat to put them down. Tamed Hamsters can now be placed in Hamster Balls, which they can roll around in for fun. Choose from 16 different colors. Place the ball on your tamed Hamster and take him for a stroll. Right click again to remove the Hamster Ball. Recipe: 8 Glass Panes, plus any Dye (or none for Clear) in the middle. Hamsters can provide power via a Hamster Wheel. There are currently 7 peafowl variations. Peahens, like Hens, lay eggs in nests (same nest recipe). You can either gather these eggs to use in recipes or leave them for the Peacock to help turn into baby chicks. You can scatter seeds (Right Click) on the ground for Peafowl to eat. There are currently 3 types of amphibians, Frogs, Dart Frogs, and Toads. They are ambient creatures, and have no favorite foods. To breed mammals, simply put an eligible Female near an eligible Male of any breed type. If the mammals are not already mated (to another mammal), they will fall in love and make children as long as they are very close by and well fed. By default it takes around 1 Minecraft day for a child to be born (this is configurable). The resulting breed is based on chance. Make sure you keep the Mother well fed during pregnancy. If the mated male and female are separated by more than 30 blocks then the relationship will be severed. Please note that females will only give milk if they have first given birth. To make baby Chicks, simply place a nest for your Hen or Peahen (recipe below is same for both). If the Hen is fed and watered, and enough time has gone by, they will lay eggs in your nest. Up to 3 eggs can be laid per nest before it is considered full. If there is a Rooster/Peacock nearby the nest, an egg has a chance to hatch into a baby chick. The resulting breed is based on chance from the parents. Please note: on 1.11 and 1.12, WAILA and The One Probe mods will show you if your animal is mated, and if you have named your animals, it will tell you the mate's name (if you sneak while viewing). These mods can also show you if the female is pregnant, when it is approximately due to give birth (or lay an egg), if the animal is fertile (and ready to get pregnant), if the bird is looking for a nest, or the female mammal is ready to give milk. As long as you keep your animal kids fed and watered they will grow. By default, it takes around 1 Minecraft day to become an adult (this value can be adjusted in the config, under Growth Ticker Timer, where a lower number makes children grow up faster). There are four omelette types, each with different abilities. Create a basic omelette in the Furnace, then add other ingredients to it in the Crafting Table. 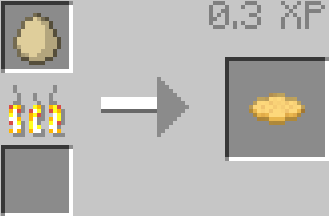 In 1.11 and 1.12, Cheese is made by placing the Cheese Mold on the ground and pouring milk directly into it. If you have WAILA or TOP installed, you will see how long before the cheese is matured. (1.11, 1.12) Troughs can be configured to accept all sorts of items (from any mod), and animals can be configured to eat these items as well. Salt Licks are blocks that you can place near certain animals that will heal them when they have less than full health. In 1.11 and 1.12, Salt is created by pouring a bucket of water into the Cheese Mold and waiting for the Water to evaporate. Via the in-game Config GUI, you can change the what the animals drop. Just go into the Drops category and enter the item you want for the animal drop you want to change. 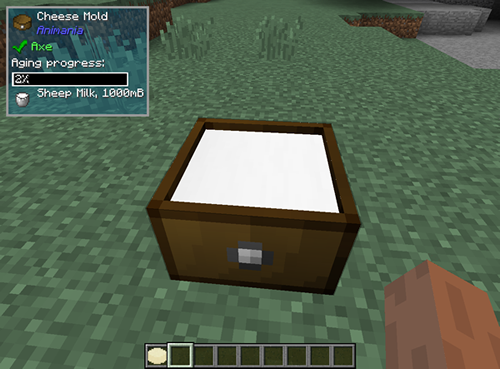 The item can come from any mod currently installed in the game. Animania contains an in game Config Gui for modifying config options. Just go to Mod Options and choose Animania to get started. Categories include: Game Rules, Care and Feeding, Spawning, Entity IDs, and Drops. Special thanks to modochu for his open source hamster mod! Many thanks to all who contributed so that people all over the world can play! You rock! Do you plan to add genders to some more Vanilla Minecraft animals (horses, llamas, wolves and cats)? Hi! First off, I'd like to say that I ADORE this mod! It is one of my all time favorite mods. Now that that has been said, I would like to bring up some issues/questions I have about the newest update. Second, I noticed the Bee Nests, which I LOVE! I just can't figure out how to get them off the tree without destroying them so I can make a Bee Hive. Thank you for all your hard work on this mod! it's amazing! One of the recent updates seems to have broken the option to set custom drops. Pigs aren't dropping bones anymore (that is set as their secondary drop), and frogs, poison dart frogs, and toads are all dropping the Animania version of frog's legs instead of the Pam's version or nothing (which is how they were set up before). I've double-checked my config files, and they haven't been reset--the game just seems to be ignoring them and using the default drops from Animania instead. how do i tame Rabbits and Froags? will Foxes be Tamelble? I really won't a pet fox XD and do all animals sleep? "Animania can now accept official Animania Add Ons (the first of which will be Cats and Dogs)"
where can i find the add ons? so far i didnt manage to find it and i dont see any links to it eithe or is the add on still in progress and this is just a preparation for the future add on? Preparation for a future add on. i have a suggestion, mabye breeds of animals will have different personalities, for example, the rhode island red could be bossy around other chickens and leghorns could be nervous around players. Is there a way to give needs to mobs from other mods? looks like the mod hasn't been updated since april, do you guys still plan on adding the other animals n such?? I wish you could make this for 1.7.10 for my series PLEASE!!! Love the mod but i think this mod is causing animals to breed hearts all over and way too many of the same type. Hi i love the mod but how can i disable the breeding because there are too many animals?